In this study, a novel platform to investigate intraneuronal molecular signatures of treatment response in bipolar disorder (BD) was developed and validated. Olfactory epithelium from BD patients was obtained through nasal biopsies. Then laser-capture microdissection was combined with Real Time RT PCR to investigate the molecular signature of lithium response in BD. Narayan, S., McLean, C., Sawa, A., Lin, S. Y., Rai, N., Hipolito, M. S., Cascella, N., Nurnberger, Jr., J. J., Ishizuka, K., Nwulia, E. A. Olfactory Neurons Obtained through Nasal Biopsy Combined with Laser-Capture Microdissection: A Potential Approach to Study Treatment Response in Mental Disorders. J. Vis. Exp. (94), e51853, doi:10.3791/51853 (2014). Bipolar disorder (BD) is a severe neuropsychiatric disorder with poorly understood pathophysiology and typically treated with the mood stabilizer, lithium carbonate. Animal studies as well as human genetic studies indicate that lithium affects molecular targets that are involved in neuronal growth, survival and maturation, and notably molecules involved in Wnt signaling. Given the ethical challenge to obtaining brain biopsies for investigating dynamic molecular changes associated with lithium-response in the central nervous system (CNS), one may consider the use of neurons obtained from olfactory tissues to achieve this goal.The olfactory epithelium contains olfactory receptor neurons at different stages of development and glial-like supporting cells. This provides a unique opportunity to study dynamic changes in the CNS of patients with neuropsychiatric diseases, using olfactory tissue safely obtained from nasal biopsies. To overcome the drawback posed by substantial contamination of biopsied olfactory tissue with non-neuronal cells, a novel approach to obtain enriched neuronal cell populations was developed by combining nasal biopsies with laser-capture microdissection. In this study, a system for investigating treatment-associated dynamic molecular changes in neuronal tissue was developed and validated, using a small pilot sample of BD patients recruited for the study of the molecular mechanisms of lithium treatment response. Bipolar disorder (BD) is a severe neuropsychiatric disorder, characterized by pathological changes in mood, drive and cognition1. Lithium used for treatment of BD has been shown to alter steady state mRNA levels of a large number of genes in animal studies2, but it remains unknown if any of these molecules is associated with clinical response in humans2. Understanding the mechanism of lithium response would require investigating lithium-induced molecular changes in neuronal tissues. Unfortunately, it is not practical to obtain brain biopsies of BD patients pre- and post-lithium therapy to identify molecular signatures of lithium response. Post-mortem brain tissues have been used to study biomarkers in BD, however, they cannot be used to assess molecular markers associated with dynamic changes in emotions, cognition and drive; and the validity of retrospectively ascertained lithium treatment response can be problematic4. Lymphocytes and other blood cells could be useful, but molecular changes in blood cells may not reflect neuronal alterations3-5. Cerebrospinal fluid may be insufficient to obtain information on intracellular molecules that may reflect disease-associated and medication-reversible intrinsic changes. The olfactory epithelium (OE) is a unique part of the central nervous system (CNS), embryologically-related to limbic structures6; and it is easily accessible through nasal biopsies. It consists of glial-like supporting (i.e., sustentacular) cells, basal proliferating cells, and olfactory receptor neurons at different stages of development7-9. Therefore, OE provides a unique opportunity to accessibly study dynamic changes in the CNS of patients with neuropsychiatric diseases7. Studies are demonstrating the utility of the OE as a surrogate tissue for investigating disease associated events that reflect those occurring in brain neurons8,9. For example, studies have utilized OE to investigate molecular profiles associated with psychiatric conditions10-14. Olfactory system also serves to identify clinical endophenoytpes such as smell deficits that are associated with negative symptoms of schizophrenia15. Additionally, neurodevelopmental processes continue in the OE throughout life, providing a useful avenue to model the underlying pathophysiology of psychiatric conditions8,9. However, a drawback to the use of this tissue is the substantial contamination of olfactory biopsies with non-neuronal cells16. For instance, total RNA used for gene expression studies in previous OE studies contained RNA extracted from the entire nasal biopsied tissue including RNA from non-neuronal cells17. Therefore, previous approaches have been limited by the quality of cells. To overcome this issue, a novel approach to obtain enriched neuronal cell populations by combining nasal biopsies with laser-capture microdissection (LCM) has been developed18. LCM is a technique that allows for the selective isolation of cells using UV laser cutting combined with infra-red laser19-21. Combining LCM with OE approach minimizes substantial contamination of OE by non-neuronal cells, thereby enhancing enrichment of neuronal cells18. Moreover, the neuronal layer can be distinguished from the submucosa layer under a microscope, thereby eliminating the need for staining. Neuronal cell types can further be distinguished from other cell populations using primary antibodies which are expressed by the cell type of interest7. Therefore, this procedure establishes an easier method for the enrichment of almost purely neuronal cell population that can be used for gene expression studies, immunohistochemistry and other morphologic investigations. This study aims to establish an experimental platform to investigate molecular changes in olfactory neurons associated with disease states and treatment response. To address this, a small set of non-smoking patients who met the DSM-IV diagnostic criteria for BD based on the Diagnostic Interview for Genetic Studies (DIG)22 was recruited to undergo two nasal biopsies: one biopsy pre-treatment with lithium and the second biopsy, after 6 weeks of daily oral lithium therapy. Furthermore, eligible BD patients must be: symptomatic for depression, based on scoring ≥10 out of 60 in the clinician administered Montgomery-Asberg Rating Scale (MADRS)23; symptomatic for hypomania or mania, based on a score ≥10 out of 56 on the clinician administered Young-Mania Rating Scale (YMRS)24; or ≥10 on both MADRS and YMRS. Rater-Inter-Rater coefficient of agreement between clinicians for both scales is >0.96. After biopsies, neurons were enriched from OE by LCM. Following additional quality control measures, to ensure extraction of high quality RNA from the tissue and neuronal enrichment, Real Time RT PCR was conducted to investigate pre- and post-treatment expression levels of genes of interest. The ensuing sections contain a description of the validation of this approach, highlighting the optimization of the protocol and the strategies that were applied for trouble-shooting the protocol. NOTE: All research volunteers in this study were administered informed consent documents approved by the Institutional Review Board of Howard University and Johns Hopkins University. Only participants who consented by signing the informed consent documents were enrolled into the study. The study base for this analysis consisted of: 20 subjects (12 BD and 10 controls; 30% males) and mean age (s.d.) of 38.2 (14.1) years. NOTE: Spray all surfaces with RNase Zap to remove RNase contamination from glass and plastic surfaces. Spray topical lidocaine (xylocaine) liquid 4% and oxymetazoline HCl 0.05% in the nasal cavity of the study participant and allow 15 mins of numbing time. Soak ½ x 3 inch surgical cottonoids in a mixture of lidocaine and oxymetazoline and insert in the nasal cavity along superior portion of the nasal septum and allow to sit for 15 min. Using a 30° rigid nasal endoscope to locate the upper section of the nasal cavity, remove nasal mucosa using up-biting nasal forceps from the superior portion of the nasal septum, taking several small specimens. Immediately prior to biopsy, fill standard sized cryomolds with tissue freezing medium. Using autoclaved tweezers, mount fresh tissue in the freezing medium and freeze on dry ice. Fill remainder of cryoblock with the freezing medium, freeze cryoblock on dry ice, and store blocks at -80ºC. Prepare polyethylene naphthalate (PEN) membrane glass slides immediately prior to cryosectioning. Spray slides with RNase Zap solution for 5 min. Then rinse slides in diethylpyrocarbonate (DEPC) water and let air dry for 30 min. Activate dried slides under UV light for 30 mins. Cryosection each block entirely at 30 µm. Keep slides on dry ice, and sections frozen as much as possible. Store slides at -80 ºC upon completion. Begin by dehydrating slides immediately prior to microdissection. Let frozen slides thaw for 10 sec, and then apply the following ethanol series to each slide: 60% (2 ml, 15 sec), 80% (2 ml, 15 sec), 95% (3 ml, 25 sec), 100% (7 ml, 60 sec). Turn photoactivated localization microscopy (PALM) microscope on and set to the following conditions: For 10X magnification set the energy to 82, focus to 74, and speed to 25 - 30. For 20X magnification, set the energy to 63, focus to 67, and speed to 5 - 6. Adjust as necessary to obtain optimal cutting results. Visually identify neurons using 20X or 10X magnification. Distinguish the thin surface olfactory neuron layer from underlying sub-mucosa under a microscope without the use of staining procedure. Observe neurons as a dense columnar appearance18. Using the Pencil function in the afore-mentioned microscope in step 4.2, trace around the neuronal layer. Trace slightly away from neurons to prevent burning of neurons from laser. This is essential for obtaining high quality RNA. Then initiate laser guided cutting. Pick up dissected sections using fine tip microdissection forceps and put tissue in a microtube containing 100 µl lysis buffer on ice. Repeat for all neuronal sections obtained from a single sample. Total dissection time per sample should not exceed 50 min. Once dissection is complete, immediately vortex sample lysates and keep on dry ice. Store samples at -80ºC for total RNA isolation. Thaw sample lysates on ice. Carry out total RNA isolation with RNAqueous Micro Kit with DNase-I inactivation by following manufacturer's protocol with no modifications (see Figure 1). The total elution volume is approximately 20 µl. Measure RNA concentration and evaluate RNA quality with RNA Integrity Number (RIN) using Bioanalyzer. Samples that meet the quality control criteria in Figure 2 can be used for cDNA synthesis. Synthesize cDNA using a validated commercial kit (see Table of Reagents). Perform the annealing step by combining 0.1 - 1.0 ng of RNA (depending on availability) and RNase free water to a total volume of 8 μl per tube. Then add 1 μl of oligo d(T)20 primer and 1 μl of 10 mM dNTP mix per tube, for a total volume of 10 μl. Gently vortex and centrifuge samples and anneal samples at 65 °C for 5 min. After the reaction is completed, immediately cool samples on ice. Prepare master mix solution according to the specifications in Table 1. Then add 9.5 µl master mix and 0.5 µl of commercially prepared reverse transcriptase (RT) to each tube. Add 0.5 µl RNase-free water to control tube instead of RT. Run a RT reaction with the first incubation at 50 ºC for 50 min, then 85 ºC for 5 min and a final 4 ºC hold, with no cycling. Dilute all samples by 5x with water and aliquot. Store samples at -80 ºC. Prepare the master mix solution according to specifications in Table 2. Use an internal control such as GAPDH. Compare olfactory marker protein (OMP) expression in microdissected tissue with OMP expression in undissected tissue to determine neuronal enrichment. NOTE: OMP is a marker for olfactory neurons. Set up PCR plate by adding 7 µl of master mix in each well and 3 µl of cDNA. Centrifuge plate for 5 min at 300 x g (1,300 rpm). Run Real Time-PCR reaction using the default thermal cycling conditions specified for commercial supermix such as SYBR GreenER qPCR. Analyze data (see Figure 2 for specifications). Perform on samples that show neuronal enrichment of 2 fold or more. Prepare master mix on ice for each probe (FAM-labeled probe of interest and VIC-labeled GAPDH) in separate tubes according to the specifications in Table 3. Set up a PCR plate with 8 µl master mix in each well and 2 µl of cDNA. Centrifuge the plate for 5 min at 300 x g (1,300 rpm). Run Real Time-PCR reaction using the default thermal cycling conditions as per the gene expression master mix protocol provided by the manufacturer. Analyze expression results (see Figure 2 for specifications). The protocol and troubleshooting strategy in the study of molecular signatures were successfully optimized. 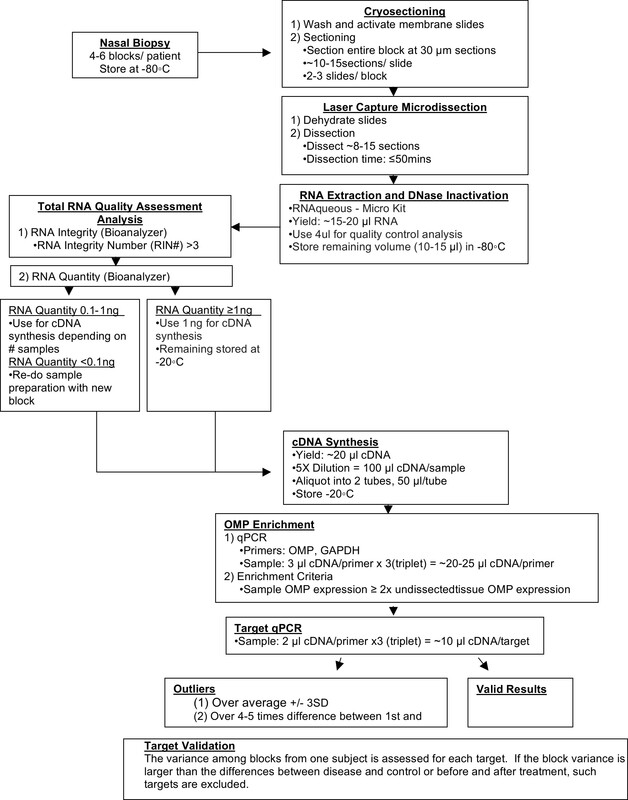 RNA quality and neuronal enrichment criteria for samples to be used in further downstream Real Time-PCR analysis were standardized. RIN and RNA concentration were examined as confounding factors to detected expression levels. Based on the analysis of several samples with RINs ranging from 1 - 10, it was determined that a minimum RIN of ~3.0 and above is sufficient for downstream analysis in this study. As a result, RNA quantity for cDNA synthesis was standardized to 1.0 ng. Thus, high quality samples with a RIN above ~3.0 and RNA amount of 1.0 ng were converted into cDNA. Samples with 0.1 - 1.0 ng of RNA could be used if an adequate sample size is difficult to obtain. Neuronal enrichment was confirmed using Real Time-PCR analysis. OMP gene expression levels in microdissected samples were compared with those in undissected samples to determine if the neuronal layer was enriched. Microdissected samples with two fold or greater OMP expression compared to non-dissected tissue are used. Therefore, by applying these criteria, the feasibility of this proposed approach for studying molecular changes in OE neurons was validated. Figure 3 illustrates that expression levels of GSK-3β are affected by lithium rather than by non-specific exogenous factors, indicating that this methodology is sufficient to detect specific molecular changes before and after lithium treatment. More specifically, alterations of molecular signatures associated with lithium treatment response in BD can be addressed by combining this molecular data with clinical data. Figure 1. RNA Extraction and DNase Inactivation Protocol. 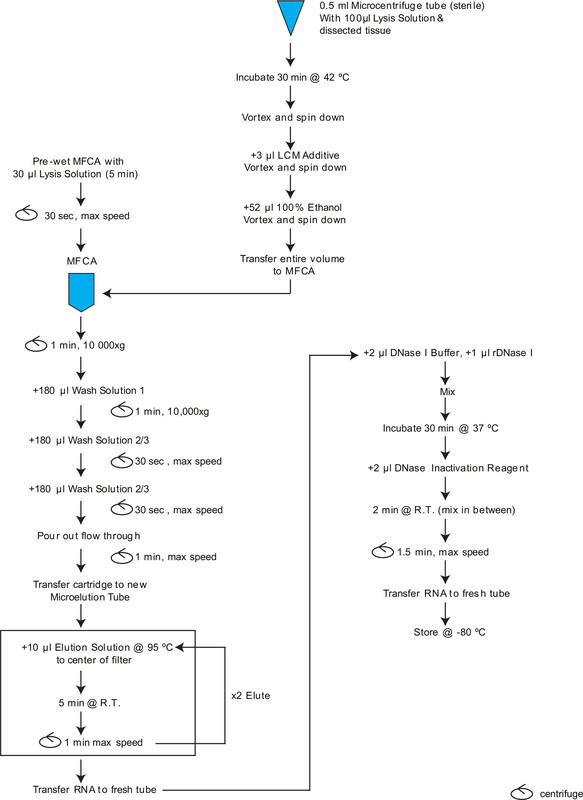 The flowchart illustrates the procedure for extracting RNA from samples after LCM. Total RNA is eluted two times to yield a maximum RNA volume of approximately 20 µl. Eluted samples then undergo DNase I treatment for DNase inactivation. Please click here to view a larger version of this figure. Figure 2. Protocol Summary. This figure summarizes the entire protocol for study experiments. Nasal tissue is first biopsied and frozen as cryoblocks. After sectioning of the tissue, the neuronal layers are dissected using LCM. RNA extraction and DNase inactivation are performed using manufacturer’s guidelines (see Figure 1). Samples that meet the quality control criteria (RIN and RNA quantity) are used to synthesize cDNA and used for neuronal enrichment analysis. Enriched samples are used in Real Time-PCR analysis with the desired targets. Please click here to view a larger version of this figure. Figure 3. GSK-3β Expression in BD and Control Samples. 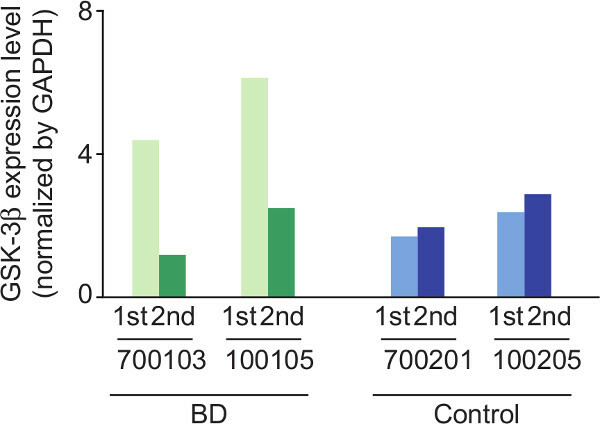 This figure illustrates the changes in GSK-3β expression levels in BD samples before and after lithium treatment and consistency in GSK-3β expression levels in control samples between the first and second biopsy. Taken together, these data demonstrate that GSK-3β expression is affected by lithium rather than non-specific exogenous factors. Table 1. cDNA Synthesis Master Mix Solution. Table 2. Neuronal Enrichment PCR Master Mix Solution. Table 3. Target PCR Master Mix. A new platform for obtaining enriched olfactory neuronal layers by combining nasal biopsy and LCM is presented and has been validated in this study. This technique can have widespread implications. It can be applied towards biomarker studies, including those for treatment response, and drug discovery efforts for other neuropsychiatric conditions, making a broader impact in the field. To obtain high quality neurons amenable to downstream applications, a few critical and troubleshooting steps must be noted. Firstly, obtain 4 - 6 pieces of olfactory tissue per patient to have an adequate sample size. Secondly, since samples are susceptible to RNA degradation, keep tissue at appropriate temperatures, work with RNase free equipment and surfaces, use gloves, and avoid breathing directly over samples. If RNA quality is still low, consider completing microdissection within 50 min and perform RNA extraction immediately after dissection or vortex samples immediately and keep on dry ice until storage at -80 °C. To increase yield of RNA, increase the number of sections dissected during LCM. A challenge of studying brain-associated molecular changes in neuropsychiatric disorders exists due to the lack of accessibility to study the human brain. Alternative approaches include the study of peripheral blood cells, autopsied brains, and induced pluripotent stem (iPS) cells. 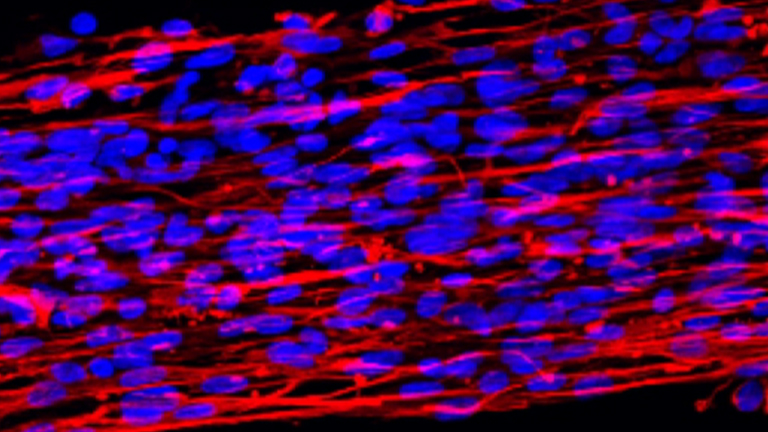 Blood cells may not represent disease-associated neuronal changes. Autopsied brains cannot be the resource to study dynamic and state changes associated with the disease progression and response to medication. iPS cells may not directly reflect state changes, because such traces are likely to be erased out during the course of reprogramming and maintenance of cells. Therefore, the advantages of using OE tissues are the ability to study both state and dynamic changes in the neuronal context. In particular, iPS derived neuronal stem cells may not adequately reflect the effect of 6 weeks of lithium treatment, due to culturing and reprogramming steps. The methodology presented in this paper allows us to study treatment-associated molecular changes and relate them to changes in clinical symptoms. It must be noted that, at least at present, the amount of neurons obtained from OE tissues is sufficient for studies at the molecular level, but may not be limited to the characterization of proteins through immunohistochemistry applications. Thus, further technical improvements are also expected. This work was supported by USPHS grants MH-091460 (E.N. ), MH-084018 (A.S.), MH-094268 Silvo O. Conte center (A.S.), MH-069853 (A.S.), MH-085226 (A.S.), MH-088753 (A.S.), MH-092443 (A.S.), and MH-096208 (K.I. ), grants from DANA (E.N. ), Stanley (A.S.), RUSK (A.S.), S-R foundations (A.S.), NARSAD (A.S. and K.I. ), and Maryland Stem Cell Research Fund (A.S. and K.I.). We sincerely appreciate the efforts and contributions of Pearl Kim, Maria Papapavlou, Nao Gamo, Youjin Chung, Yukiko Lema and Mark Christie towards coordination of the biopsy process. Goodwin, F. K., Jamison, K. R. Manic-depressive illness. Oxford University Press. (1990). Einat, H., Manji, H. K. Cellular plasticity cascades: genes-to-behavior pathways in animal models of bipolar disorder. Biol Psychiatry. 59, (12), 1160-1171 (2006). Severino, G., et al. Pharmacogenomics of bipolar disorder. Pharmacogenomics. 14, (6), 655-674 (2013). Beech, R. D., et al. Gene-expression differences in peripheral blood between lithium responders and non-responders in the Lithium Treatment-Moderate dose Use Study (LiTMUS). Pharmacogenomics J. 14, (2), 182-191 (2013). Horiuchi, Y., et al. Olfactory cells via nasal biopsy reflect the developing brain in gene expression profiles: utility and limitation of the surrogate tissues in research for brain disorders. Neurosci Res. 77, (4), 247-250 (2013). Dryer, L., Graziadei, P. P. Projections of the olfactory bulb in an elasmobranch fish, Sphyrna tiburo: segregation of inputs in the telencephalon. Anat Embryol (Berl. 190, (6), 563-572 (1994). Hahn, C. G., et al. In vivo and in vitro neurogenesis in human olfactory epithelium. J Comp Neurol. 483, (2), 154-163 (2005). Cascella, N. G., Takaki, M., Lin, S., Sawa, A. Neurodevelopmental involvement in schizophrenia: the olfactory epithelium as an alternative model for research. J Neurochem. 102, (3), 587-594 (2007). Sawa, A., Cascella, N. G. Peripheral olfactory system for clinical and basic psychiatry: a promising entry point to the mystery of brain mechanism and biomarker identification in schizophrenia. Am J Psychiatry. 166, (2), 137-139 (2009). Mor, E., et al. MicroRNA-382 expression is elevated in the olfactory neuroepithelium of schizophrenia patients. Neurobiol Dis. 55, 1-10 (2013). Kano, S., et al. Genome-wide profiling of multiple histone methylations in olfactory cells: further implications for cellular susceptibility to oxidative stress in schizophrenia. Mol Psychiatry. 18, (7), 740-742 (2013). Toritsuka, M., et al. Deficits in microRNA-mediated Cxcr4/Cxcl12 signaling in neurodevelopmental deficits in a 22q11 deletion syndrome mouse model. Proc Natl Acad Sci U S A. 110, (43), 17552-17557 (2013). Evgrafov, O. V., et al. Olfactory neuroepithelium-derived neural progenitor cells as a model system for investigating the molecular mechanisms of neuropsychiatric disorders. Psychiatr Genet. 21, (5), 217-228 (2011). Fan, Y., et al. Focal adhesion dynamics are altered in schizophrenia. Biol Psychiatry. 74, (6), 418-426 (2013). Ishizuka, K., et al. Negative symptoms of schizophrenia correlate with impairment on the University of Pennsylvania smell identification test. Neurosci Res. 66, 106-110 (2010). Sattler, R., et al. Human nasal olfactory epithelium as a dynamic marker for CNS therapy development. Exp Neurol. 232, (2), 203-211 (2011). Rimbault, M., Robin, S., Vaysse, A., Galibert, F. RNA profiles of rat olfactory epithelia: individual and age related variations. BMC Genomics. 10, 572 (2009). Tajinda, K., et al. Neuronal biomarkers from patients with mental illnesses: a novel method through nasal biopsy combined with laser-captured microdissection. Mol Psychiatry. 15, (3), 231-232 (2010). Bonner, R. F., et al. Laser capture microdissection: molecular analysis of tissue. Science. 278, (5342), 1481-1483 (1997). Fink, L., et al. Real-time quantitative RT-PCR after laser-assisted cell picking. Nat Med. 4, (11), 1329-1333 (1998). Emmert-Buck, M. R., et al. Laser capture microdissection. Science. 274, (5289), 998-1001 (1996). Nurnberger, J. I. Jr, et al. Diagnostic interview for genetic studies. Rationale, unique features, and training. NIMH Genetics Initiative. Arch Gen Psychiatry. 51, (11), 849-859 (1994). Montgomery, S. A., Asberg, M. A new depression scale designed to be sensitive to change. Br J Psychiatry. 134, 382-389 (1979). Young, R. C., Biggs, J. T., Ziegler, V. E., Meyer, D. A. A rating scale for mania: reliability, validity and sensitivity. Br J Psychiatry. 133, 429-435 (1978).